Instead of boring you with a rambling intro, let's keep a good thing going by reviewing another product from the Benefit skin care line. 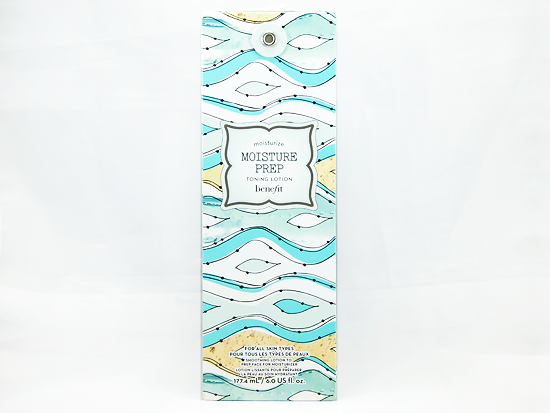 This time, the spotlight is on their Moisture Prep Toning Lotion. I know the term "toning lotion" is a bit confusing. Is it a toner or is it a lotion, aka a moisturizer? Well, simply put it is indeed a toner, but one that's more enhanced with a variety of ingredients to give it more oomph than your regular, run of the mill toner. Toning lotions in general don't just remove any dirt or makeup residue left on your skin, they're meant to also revitalize and restore the skin's pH and moisture balance which in turn also preps your skin for the remaining products you'll be applying after. Like the serum, the Benefit toning lotion comes in an equally lovely looking box and bottle. Again, it's got that cute, faux cork cap. The main difference is that the bottle is plastic instead of coated glass. Due to the bottle's quite large size, opting for glass would make it heavier and less travel friendly than it already is, again because of its size. Also, this doesn't have a pump or anything just a large hole for the opening so you can easily pour out too much product by accident. It does make saturating a cotton ball/pad easier though, which is what Benefit recommends for how to use the product. Thankfully, despite the lack of a pump or even just a smaller sized hole, the product still doesn't leak out. The toner itself, is probably on the thicker side compared to your average toner, but it is still very runny and water-like. Like the serum, it absorbs fairly quickly as well so you're not left waiting ages to move onto the next step in your skin care regime. Like Benefit suggests, I saturate a cotton pad with the toner and apply it all over my face after washing with a cleanser then follow it up with a serum and/or essence. If you don't use either, you can skip straight to your moisturizer of choice. As per usual now with skin care items, I ran the ingredients through CosDNA and was a little worried to see that there were a lot ingredients in this that were more in the neutral (yellow) zone when it came to the Safety rating scale, whereas the serum had most of its ingredients in the safe (green) zone. If an ingredient is in the neutral zone, it basically means that it, the ingredient, is neither safe nor dangerous for long-term usage according to reports from the CIR (Cosmetic Ingredient Review), RTECS (Registry of Toxic Effects of Chemical Substances), FDA (Food and Drug Administration), etc. Similar to the serum though, the toner does have a lot of ingredients in it that helps retain moisture as well as softens and smoothens skin such as Glycerol (absorbs and retains moisture and improves the hydration of the outer skin layer), Oat Kernel Extract (soothes and moisturizes skin), and Biosaccharide Gum-1 (binds water to the skin) amongst others. It also contains Benzophenone-4 or BP4 which is a chemical UV absorber. This struck me as strange considering nowhere is it mentioned on the product, or even on Benefit's official website, that this toner is supposed to offer sun protection of any kind. After some research though, I found out that BP4 is added to many skin care, and even cosmetic, products in order to help protect the actual product from degrading if it's exposed to UV light or sunlight (source, source 2). That's all well and good, but Dr. David from truthinskincare.com does mention that Benzophenone, also labeled as "oxybenzone", is absorbed through the skin and into the body much more to other comparable sunblock ingredients. Although there doesn't appear to be any solid studies yet that show this can be bad for us or cause negative effects with long-term use, it's just something to take note of and can explain why it's rated as neither safe nor dangerous on CosDNA. Sodium Lauryl Sulfate (SLS) - An emulsifier, cleaning agent, surfuctant, and foam booster. Rated a "5", the highest rating, on the Comedogenic scale meaning it has a very high chance of blocking pores and causing acne and/or blackheads. It is also rated a "2" on the Irritant scale meaning it has a low but still possible chance of causing a negative skin reaction, especially if you have sensitive skin. Butylene Glycol - Given a rating of "1" on the Comedogenic scale meaning it has a very low but still possible risk of the serum blocking pores and causing acne and/or blackheads. Carbomer - An emulsifier. Ranked "1" (very low) on the CoSDNA 1-5 Irritant scale. Benzophenone-4 (BP4) - Acts as an irritant and allergan when topically applied to the skin (source). BHT (Dibutylhydroxytoluene) - A preservative. Ranks high on the CoSDNA Safety scale meaning it has potential hazards that come with long-term use of the product. I highly recommend going through the ingredient list HERE which I uploaded on CoSDNA for this product and take note of the Safety, as well as Irritant and Comedogenic, rankings for the other ingredients I didn't mention. 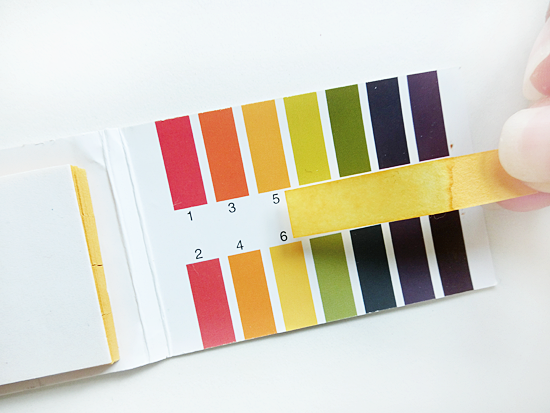 The optimal pH of human skin is 5.5, and the toner seems to falls somewhere between a pH level of 5 and 6. This is good because it's very similar to our natural pH. It's not too alkaline for the skin. Just a little, at most, if it's more towards the pH of 6. Personally I try not to use skin care products that have a pH higher than 6 and lower than 4. NOTE: Since I forgot to do a pH test at the time for the Instant Comeback Facial Serum, I'll just mention it here. The serum has a pH of around 5, making it good as well since it's not too acidic for the skin. Okay, let's start with the good news. The toning lotion, much like the serum, is good for giving skin a significant hydration boost. 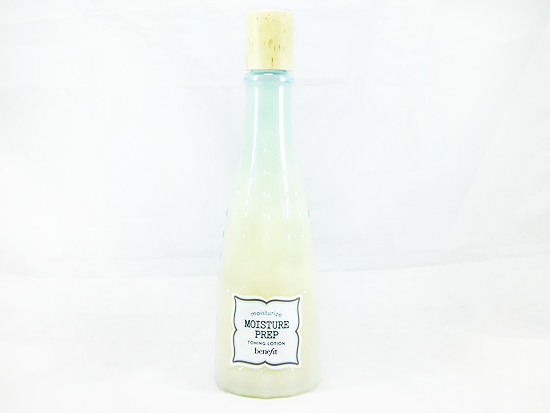 It also easily mops up any dirt and makeup residue left on the skin after washing and does restore some moisture to the skin, particularly if you're using a face wash that's quite drying or if your like me and your skin easily becomes dry after washing your face. Like Benefit promises, it also makes my skin feel a tad bit smoother afterwards and I really do feel that it helps, to some degree, prep my skin for the other products I'll be slathering on and thus renders them more effective. Even if your face is a virtual oil slick most of the time, added hydration is never a bad thing. Quite the opposite, in fact! My skin, overall, does feel a bit more refreshed and soothed immediately after application. Now for the bad news...Acne! That's right. Unfortunately, whenever I used this, the next day there was guaranteed to be at least one new zit on my face. One time in particular, after using this at night before bed, I woke up to three zits on my face that certainly weren't there the night before. Of course, to make doubly sure it was the toning lotion, I stopped using it for a few days or so. Sure enough, I didn't notice any added, significant breakouts on my skin. Once I tried it again, they appeared as I expected. The culprit was clear. All of them each time very were very small, I assure you. Just wee, red bumps. They're still not a welcome visitor to my face though! I immediately stopped using the toning lotion then. Yes, I am slightly acne-prone, but the fact that new spots would pop up the next day after using this product was too much of a coincidence, don't you think? I'm going to go ahead and blame this on the Sodium Lauryl Sulfate (SLS) present in the toner. After all, it was given the highest Comedogenic rating as I mentioned earlier. My own skin and SLS don't appear to get along. In summary, this product isn't for me. I do like the other benefits it gives my skin and it's very much a decent if not fairly good toner which I think will happily suit all skin types. It makes skin feel cleaner, smoother, and more refreshed while also prepping it for your other skin care products to follow. However, said benefits just aren't enough to make me subject myself to the plight of constantly appearing zits. Tiny as they may be. I mean, who would be willing to really? If you've used this toner before and liked it, then that's great! I'm glad you two have a lovely relationship (hah). As for me, we're parting ways and it's going to a dark corner in my room...or at least to someone else who'll reap its benefits better than I. The lovely packaging, and the fact that the bottle is plastic which is good for klutzes like me. Lightweight and absorbs fairly quickly. Perfect for those living in hot, humid climates and/or with oily skin. It makes skin feel a little bit smoother and more refreshed after washing your face and helps to remove any remaining dirt or makeup. Has a nice but mild 'fresh' scent to it. Benefit is generous with the amount of product you get and one bottle can last you quite a while, even if you use it twice a day. Due to the bottle's size, it's not travel-friendly. You'll need to transfer it into a smaller container. I wish this had a pump for dispensing, or at least a smaller hole for an opening. A little on the expensive side of the price range. Might irritate skin for those who are sensitive to products with fragrance.